Material: Made from a special natural rubber fabric. LiferaftsLiferafts are a critical life saving appliance. In times of distress, it is the liferaft that transports people ashore to safety. Mm Cargo Gear And Marine Services Pvt Ltd Is D.G Shipping, India Approved Liferaft Service Station. 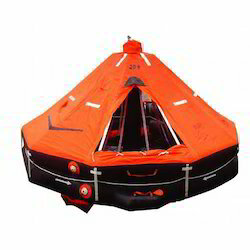 We Are Also Approved By Various Other Liferaft Manufacturers. We are involved in providing our patrons with a perfect quality Inflatable Life Rafts. The offered raft is exceptionally useful in life-saving applications at sea. - Comply to solas-lsa code 96. - Tested and evaluated as per imo resolution msc 81(70). - Approved by director general of shipping, ministry of surface transport, govt. Of india. - Capacity of 12 persons. - Availability ex-stock at select indian ports. - Servicing facilities available at all important ports. A Life raft is a small, rigid or inflatable watercraft carried for emergency evacuation in the event of a disaster aboard ship. In the military, a lifeboat may be referred to as a whaleboat, dinghy, or gig. The ship's tenders of cruise ships often double as lifeboats. Lifeboat drills are required by law on larger commercial ships. We have uniquely positioned in the market by supplying our customers best quality collection of Marine Liferaft.